Avoch Amenities Association accepts a cheque from Scotmid Co-operative. "Our community grant scheme is our way of giving back to the local areas that are served by our stores..."
Scotmid Co-operative is inviting community groups and projects from the Inverness and Black Isle area to apply for funding through its community grant scheme. Scotmid’s community grant scheme awards funding to local projects and organisations that make a difference to their local community. To be eligible for a Scotmid grant, a group or project must be based in a community served by a Scotmid store. Scotmid has 12 stores in the Inverness and Black Isle area, serving the communities of Glenurquhart, Raigmore, Hilton, Balloan, Culduthel, Smithton, Culloden, Balloch, Munlochy, Beauly, Drumnadrochit and Avoch. 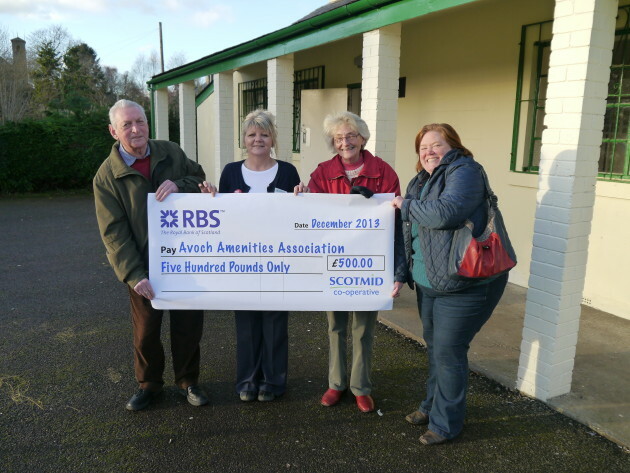 Avoch Amenities Association is one of the most recent community groups that has been supported by Scotmid. The grant of £500 was awarded by Scotmid’s North Regional Committee to help with replacing the banks around the community bowling green. Other projects that Scotmid has previously supported in the area include Highland Youngsters with Diabetes, the Libertie Project and Raigmore Girls Group. Community groups and projects can apply by completing a community grant form from their local Scotmid store or online at www.scotmid.coop. Community groups and projects must meet certain criteria to be considered for funding. The applications are then considered by Scotmid’s North Regional Committee. Scotmid’s North Regional Committee is made up of eight, elected Scotmid members from Perth to the Northern Isles.